The Taiwanese chain recently soft-opened its first Northern California location in Oakland Chinatown, and the grand opening is coming soon. One Zo pearls are a lot softer than what you’d find at other shops. From matcha to black sesame to taro to red beet, there’s a flavor of fresh, house-made boba for everyone at One Zo Oakland. And the term “fresh, house-made boba” doesn’t just refer to the drinks. The boba (tapioca pearls) themselves are made in-house, and because the shop has complete control over the boba-making process, boba makers can add ingredients like matcha powder or black sesame seeds to change the flavor of the boba itself. In the East Bay, where boba shops are becoming increasingly ubiquitous, handmade, flavored boba makes One Zo stand out from the crowd. “It is a lot different from any other boba shop you can get boba from in the Bay Area,” said Neville Yeung, manager of the Oakland One Zo shop. Most pre-packaged boba is black in color, which Yeung said comes from the black sugar used to flavor it. Most boba shops only offer plain boba, and according to Yeung, pre-packaged boba typically contains preservatives that give it a shelf life of one or two years. 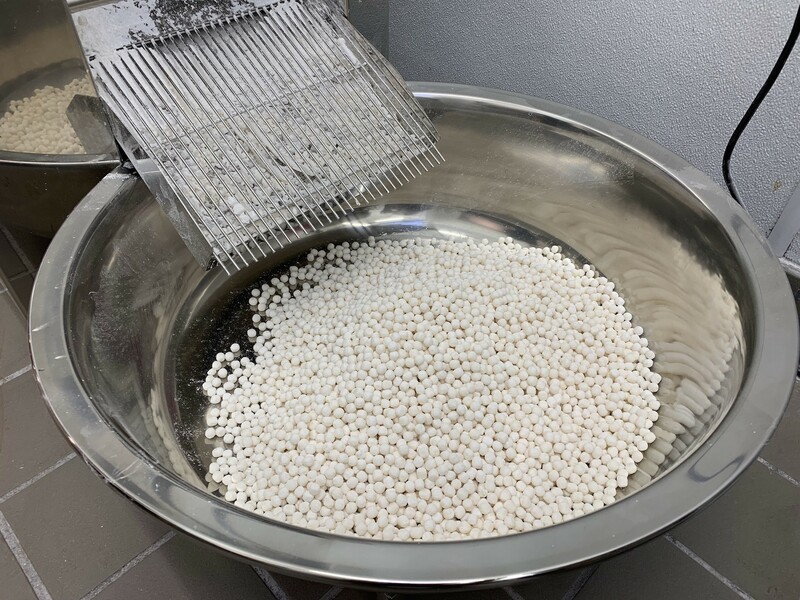 But at One Zo, flavors are added into the tapioca starch during the boba-making process to create a flavored “dough,” and the boba attains the color of whatever ingredients are added for flavor. Black sesame boba is grayish-black; matcha is green; taro is purple; honey is golden; and beet is red. The pearls are also a lot softer than what you’d find at other shops. Yeung said the shop has experimented with making about 15 different flavors, and there are typically five or six flavors available on any given day. Customers can ask to sample the boba before deciding which one to order. The shop has also been experimenting with making boba that contains two or three layered flavors in a single pearl; Yeung hopes to offer multi-colored boba in the coming months. And unlike pre-packaged boba, One Zo’s boba is made fresh, so it doesn’t contain any preservatives. Since One Zo makes its boba in small batches, they typically have to make fresh boba every day to keep up with demand. There’s even an open area in the kitchen where customers can watch boba being made. The shop has been in soft-opening mode since October. The grand opening will take place on Nov. 18 and 19 at the Oakland location (362 8th St., Suite A) from noon to 10 p.m. There’ll be free drinks for the first hundred customers on Nov. 18, and on both days, the shop will be running a buy one, get one free promotion. ... In other food news, Starter Bakery has moved from Oakland to Berkeley, and now occupies the former Pyramid Brewing space (901 Gilman St.). The new space is 10 times larger than the previous space, allowing the bakery to expand its list of wholesale clients. The bakery specializes in pretzels, pain de mie burger buns, and laminated dough pastries such as kouign amann. But with the expansion, the bakery also plans to increase its focus on bread. Best of all, there’ll be a retail shop opening up eventually — the date has not yet been determined. And as of Nov. 8, chef Tanya Holland of recently shuttered Brown Sugar Kitchen is serving up a new menu at the Oakland Floodcraft Taproom, inside Whole Foods (230 Bay Place). The menu features snacks like sweet corn and jalapeño hush puppies, small plates such as jerk pork belly sliders, and entrees including fried chicken sandwiches and vegetarian muffulettas.